Monuments to Confederate soldiers and generals hold prominent positions in dozens of cities across the southern United States. Over the weekend, one of them — a statue of Confederate leader Robert E. Lee in Charlottesville, Virginia — became the site of a violent clash between white supremacists and anti-racist counter-protesters. The movement to remove such monuments has picked up steam after a white supremacist killed nine people at a Charleston, South Carolina, church in June 2015. The Confederate battle flag, which flew on the grounds of the state’s capitol in Columbia, was lowered following the shooting. So far, Mic has identified 35 movements in 2017 that have removed or are pushing to remove specific Confederate monuments. Many of these efforts began or were renewed in the days since the violence in Charlottesville. That includes online petitions, in-person protests, moves by city officials and other efforts to remove memorials. At least thirteen Confederate monuments have been removed from public land in 2017 alone (a fourteenth was relocated from public land in one Kentucky city to another). Seven of those removals have occurred since the violence in Charlottesville. Mic has verified more than 140 Confederate monuments across 17 states that are on public land, often in proximity to county courthouses or in city parks. A number of national movements have emerged calling for the removal of all Confederate monuments, but this list is more focused on local efforts specific to certain monuments. In 2016, the Southern Poverty Law Center identified more than 1,500 Confederate symbols in public places, including at least 700 on public property. Five southern states have more than 100 public symbols. Virginia has more than 200. 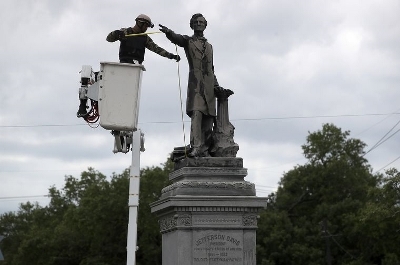 A New Orleans city worker wears body armor and a face covering as he measures the Jefferson Davis monument in May in New Orleans, six days before its removal. Thanks to the Mic readers who helped us crowdsource the information on this spreadsheet. We’re still accepting your help to track the nationwide movements to remove Confederate monuments. Know of one? Reach out through this form. Keep reading to see the movements we are tracking, and learn more about the effort at the bottom of this article. Birmingham: The city covered up a Confederate monument as it debates whether to remove the memorial permanently. Tampa: The city commission voted to move a Confederate monument before the Charlottesville violence. As of Tuesday, the statue is still there. Annapolis: Democratic and progressive leaders are calling for the removal of the statue of a Confederate leader on the state Capitol grounds. Ellicott City: County leaders are discussing removing a Confederate monument. Memphis: The city of Memphis is trying to convince a state agency to let it remove two Confederate statues on public land. Dallas: A day before the event in Charlottesville began, protesters in Dallas called for the removal of a Confederate monument. San Antonio: A crowd called for the removal of a Confederate statue following the violence in Charlottesville. Charlottesville: The Robert E. Lee statue in Emancipation Park was the site of the “Unite the Right” rally that drew hundreds of far-right protesters demonstrating against the monument’s planned removal and resulted in the death of one counter-protester. Richmond: Protesters demanded the removal of several statues of Confederate leaders on Monday, Aug. 14. The mayor has continued to call for updating the statutes to clarify what they represent, not removing them. Detail of Jasper Confederate Monument with cavalryman, infantryman, and a Confederate flag made of flowers. Jasper, Alabama. This is a list of Confederate monuments and memorials. The monuments and memorials honor Confederate leaders, soldiers, or the Confederate States of America in general during the American Civil War. A 2017 study reported that at least 1,503 symbols of the Confederacy can be found in public spaces across the country, including physical monuments and memorials as covered in this list, but also including other symbols such as schools named after Confederate leaders, along with Jefferson Davis Community College (Alabama), Lee College (Texas), and Washington and Lee University (Virginia). Four counties are named for Jefferson Davis (Georgia, Louisiana, Mississippi, Texas), nine for Robert E. Lee (Alabama, Arkansas, Florida, Georgia, Kentucky, Mississippi, North Carolina, South Carolina, Texas), and two for Stonewall Jackson (Oklahoma, Texas. Many of these monuments were erected in the early 20th century, decades after the Civil War, and have some relationship with campaigns to promote and justify Jim Crow laws in the South. Art historians Cynthia Mills and Pamela Simpson noted in their critical volume Monuments to the Lost Cause that the majority of Confederate monuments were "commissioned by white women, in hope of preserving a positive vision of antebellum life.” Many Confederate monuments were erected in the former Confederate states and border states in the decades following the Civil War, in many instances by the United Daughters of the Confederacy, Ladies Memorial Associations, and other memorial organizations. Other Confederate monuments are located on Civil War battlefields. Many Confederate monuments are listed on the National Register of Historic Places, either separately or as contributing objects within listings of courthouses or historic districts. There are at least 107 publicly-supported spaces dedicated to the Confederacy in Alabama. There are at least 3 publicly-supported spaces dedicated to the Confederacy in Arizona. There are at least 57 publicly-supported spaces dedicated to the Confederacy in Arkansas. In Georgetown: Delaware Confederate Monument, unveiled in 2007. 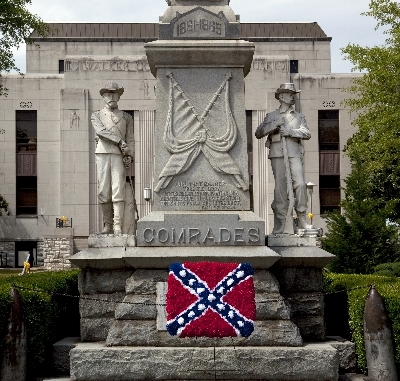 There are at least 174 publicly-supported spaces dedicated to the Confederacy in Georgia. There are at least 2 publicly-supported spaces dedicated to the Confederacy in Idaho, in Boise. There are at least 3 publicly-supported spaces dedicated to the Confederacy in Iowa, in Betonsport and Bloomfield. There are at least 56 publicly-supported spaces dedicated to the Confederacy in Kentucky. There are at least 91 publicly-supported spaces dedicated to the Confederacy in Louisiana.. In New Orleans, after nine black churchgoers were killed in a racially-motivated massacre in Charleston, S.C., the New Orleans City Council ordered the removal of statues of Confederate President Jefferson Davis; General Robert E. Lee, who resigned his U.S Army commission at the time of Virginia's secession and accepted command of the state's military forces; General Pierre G.T. Beauregard, who oversaw the Battle of Fort Sumter; and the Battle of Liberty Place Monument. Court challenges were unsuccessful. The workers who moved the monuments were dressed in bullet-proof vests, helmets, and masks to conceal their identities because of concerns about their safety. According to Mayor Landrieu, "The original firm we’d hired to remove the monuments backed out after receiving death threats and having one of his cars set ablaze." There are at least 131 publicly-supported spaces dedicated to the Confederacy in Mississippi. There are at least 140 publicly-supported spaces dedicated to the Confederacy in North Carolina. There are at least 112 publicly-supported spaces dedicated to the Confederacy in South Carolina. There are at least 80 publicly-supported spaces dedicated to the Confederacy in Tennessee. There are 178 publicly-supported spaces dedicated to the Confederacy in Texas. There are at least 223 publicly-supported spaces dedicated to the Confederacy in Virginia. There are at least 2 publicly-supported spaces dedicated to the Confederacy in Washington, D.C. There are at least 17 publicly-supported spaces dedicated to the Confederacy in West Virginia. 1. Gunter, Booth; Kizzire, Jamie. Gunter, Booth, ed. "Whose heritage? Public Symbols of the Confederacy" (PDF). Southern Poverty Law Center. Retrieved 2017-08-15. 2. Dwyer, Colin (August 14, 2017). "Charlottesville Rally Aimed To Defend A Confederate Statue. It May Have Doomed Others". NPR.org. Retrieved 2017-08-15. 3. Bain, Marc (August 15, 2017). "The shoddy manufacturing story behind all those Confederate statues around the US". Quartz. Retrieved 2017-08-16. 4. Edwards, Stassa (August 15, 2017). "Confederate Monuments Aren't History, They're a Cheap Cultural Memory". Jezebel. Retrieved 2017-08-16. 6. Wiggins, David N. (2006). Georgia's Confederate monuments and cemeteries. Charleston, SC: Arcadia. ISBN 9780738542331. OCLC 67612617. 9. Caroline E. Janney. "Ladies' Memorial Associations". Encyclopediavirginia.org. Retrieved May 23, 2017. 10. Caroline E. Janney. "Lost Cause, The". Encyclopediavirginia.org. Retrieved May 23, 2017. 11. National Park Service (2009-03-13). "National Register Information System". National Register of Historic Places. National Park Service. 109. "Confederate Mound Oak Woods Cemetery--Civil War Era National Cemeteries: A Discover Our Shared Heritage Travel Itinerary". April 2, 2016. Archived from the original on April 2, 2016. 110. Ryckaert, Vic (2014-07-12). "Group wants to restore Confederate fighters’ monument". Indianapolis Star. Retrieved 2017-08-16. 117. Mele, Christopher (2017-04-24). "New Orleans Begins Removing Confederate Monuments, Under Police Guard". The New York Times. ISSN 0362-4331. Retrieved 2017-08-15. 118. Robertson, Campbell (2017-05-19). "From Lofty Perch, New Orleans Monument to Confederacy Comes Down". The New York Times. ISSN 0362-4331. Retrieved 2017-08-15. 119. Turque, Bill (2017-07-24). "Confederate statue moved from Rockville courthouse over the weekend". The Washington Post. ISSN 0190-8286. Retrieved 2017-08-15. 124. Grierson, Jamie (2017-08-16). "Baltimore takes down Confederate statues in middle of night". The Guardian. ISSN 0261-3077. Retrieved 2017-08-16. 125. Sun, Colin Campbell | Baltimore; Sun, Colin Campbell | Baltimore (2016-05-16). "As Confederate symbols come down, ‘Talbot Boys’ statue withstands the controversy". The Washington Post. ISSN 0190-8286. Retrieved 2017-08-15. 126. Turque, Bill; Turque, Bill (2017-07-24). "Confederate statue moved from Rockville courthouse over the weekend". The Washington Post. ISSN 0190-8286. Retrieved 2017-08-15. 127. Acitelli, Tom (2017-06-09). "Massachusetts’ only Confederate memorial likely to be taken down". Curbed Boston. Retrieved 2017-08-16. 147. Hampson, Rick (May 22, 2017). "Confederate monuments, more than 700 across USA, aren't budging". USA TODAY. Retrieved 2017-08-15. 148. "Confederate Soldiers Monument, Durant, Oklahoma". www.civilwaralbum.com . Retrieved 2017-08-15. 161. http://www.co.waller.tx.us/upload/common/docs/Veterans/memorial_book.pdf . Retrieved 15 August 2017. 227. Shaw, Jerry (September 1, 2015). "Where You Can Find Confederate Flag Flying in Wyoming". Newsmax. Retrieved August 15, 2017. 228. Barron, Joan (September 5, 2010). "Wyoming pioneer John C. Hunton gets Confederate gravestone". The Billings Gazette. Retrieved August 15, 2017.